Vikki Wakefield is a master at capturing YA plus suspense, plus teens, in country Australian towns. Just like her other novels, she once again effortlessly portrays the culture and issues affecting not only the teen protagonist and their peers but the spirit of everyone and the town around them. 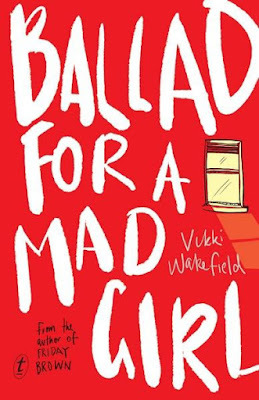 In Ballad for a Mad Girl, Wakefield does it again, this time raising the bar with a riveting, beautifully told ghost story that draws you in until the very last page. Seventeen-year-old Grace Foley has always been a prankster. Daring, funny, bold and audacious, she revels in overstepping the line and getting a laugh, no matter what the consequences. Grace isn't afraid of anything, according to her best friend Kenzie. One night, in the tradition of the Swampies vs the Sacred Heart kids, and wanting to uphold her pipeline crossing record, Grace takes on the challenge of the fastest crossing. The pipeline, crossing over a deep chasm, is dangerous and scary – rumour has it that Hannah Holt's missing body was dumped there twenty years ago. During the challenge, Grace experiences something eerie and life changing. She will never be the same. Grace becomes obsessed with the Holt mystery and sees and experiences things she can't explain. She becomes haunted and doesn't know who to turn to as her friends and family can't tell if she's serious. The strength of this novel are Wakefield's characters, suspense and tension. The characters are real, as is their life, their dialogue and conflicts. The suspense and tension are so realistic, I found it hard to put this book down. Grace doesn't know if she's going mad or if someone really is sending her messages from beyond the grave. What will the truth reveal? Will she be normal again? This book doesn't disappoint. There's enough twists and turns to keep the reader mesmerised. One word of advice: read this during the day!